I continue my travel and food tales to take you to a city I love – Chennai. I’ve always wondered about my affection for Chennai considering I’ve never lived there longer than a month a time. But I think you also love a place based on experiences you’ve had there in the past. And I’ve had some wonderful times in Chennai, oh so long ago. I know there have been many changes in the city.One of the changes I’ve heard about is a change in eating habits. Now that’s something I’ve just got to see. I was chatting with a friend who now lives there and he told me that fast food is quite popular and you get great burgers in Chennai! It seems too long since I’ve visited although I have friends there who have generously offered to host me. I think a part of me wants to remember Chennai as it was in the ‘old days’. But nothing stays the same. And change is not always a bad thing. I’m hoping when I visit Chennai manages to charm me still. The soul of a people and a city never changes, they say. I’m keeping my fingers crossed. I can still recall my stay, on work, at Hotel Ashoka, near Egmore and all the lovely breakfasts I had there. I remember, when I would go down to the restaurant on Sunday evenings for dinner there would be many Marwadi families feasting on idlis and dosas! And how can I forget all the ‘kaiyendhi bhavans’ famous for such a variety of fast food. A ‘kaiyendhi bhavan’ is a cart which has a stove on which fresh, hot food is prepared and served. Usually run by a family, these carts are found on the roadside and are a good place to go to for great food, when your favourite restaurant is closed. Idlis, dosas, omelettes and the famous koththu parotta are part of the regular fare. When I asked my friend to list out the best fast food joints in Chennai, he literally went to town with information. There’s a lot of variety to choose from and since he’s a foodie, I got the inside scoop! Then there are mini samosas, medhu pakodas and masala vadas available at a small sweet shop diagonally opposite the Jain Temple at Mylapore, which I’m told not to miss. If I’m looking for chaat, I must head to Sowcarpet. Bhelpuri, paani puri, daabeli, ghatia, bujiya bondas and jalebis are pretty authentic here, I’m told. And these can be washed down with lassi and followed up with basundi! Mmmmm…. MacDonald’s, KFC and Subway are good fall backs as always. But there are other chains and fast food joints I must explore. For subs and salads, I could visit The Soup and Salad Cafe at Adyar and Alwarpet for vegeterian fare or check out the World of Subs and Salads outside More Supermarket, ECR, Thiruvanmiyur for non-vegetarian subs. Another recommendation is the Brick House Bistro at Anna Nagar. 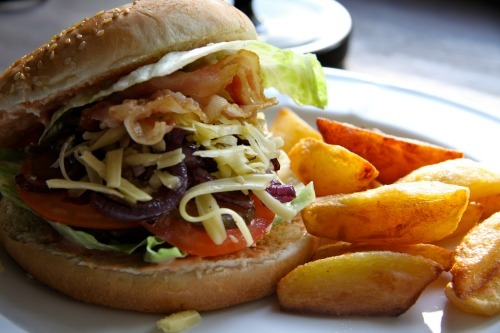 My friend recommended the beef patty burger there! I’ve been told that Marry Brown is one of the best places to eat fast food in Chennai – burgers, fries, fried chicken, wraps, salads and the works! I don’t know about you, all this talk of Chennai and the food makes me want to get there fast! Watch out friends, here I come! Yum. Just having got back from Chennai, I am already missing the food Corinne! My favourite breakfast at Chennai was always idli’s &dosa with sambar. 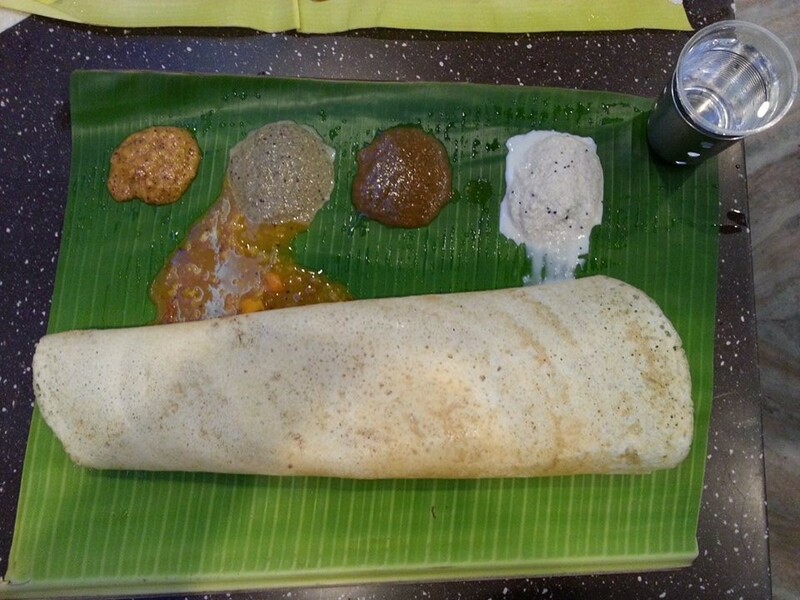 I stayed at chetpet for a whole year loved visiting the south Indian hotels, I remember I would go out with my friends and at any time of the day prefer dosa.. with coconut chutney. I remember shopping at T Nagar and while returning have some nice vada and coffee with my friend. I like the smell of coffee… reading your post and looking at the images feel like taking a trip. thank you for sharing..
Reading your post took me back to my sojourn in Madras (never Chennai to me!) and I almost wrote Vidya Subramaniam when I was about to comment – so powerful is nostalgia. Studying for my undergrad in Madras and then working there for a few years – oh yeah – I know all about the food. I love the place, what can I say! The kaiyendi bhavan people are so cheerful, loving and friendly! Wow, even I always thought Chennai was all about idlis and dosas!! The ‘kaiyendi bhavan’ sounds like a must try! I love reading about native foods in India… it’s become my favorite kind of meal!